What is “stuff”? The New York Times devoted part of its Sunday front page to the question of what, exactly, the term means in baseball. It is, John Branch of the Times reported, an underexamined mystery of the game. This is not true, or it is only true in the sense that baseball players are trained in playing baseball, not in lexicography, so that they struggle when asked for a definition of “stuff.” They can’t define “stuff” because they know what stuff is completely and instinctively. Stuff is a pitcher’s pitches, judged by how inherently hard those pitches are to hit. Put them together and you have how people talk about pitchers. Great stuff, delivered with maximum craft, is Pedro Martinez. Great stuff with minimal craft is Nolan Ryan. Great craft without stuff is Greg Maddux. It’s hard to name pitchers with neither craft nor stuff because those are the pitchers who usually don’t last. (Stuff is what makes teams keep giving new chances to terrible pitchers.) 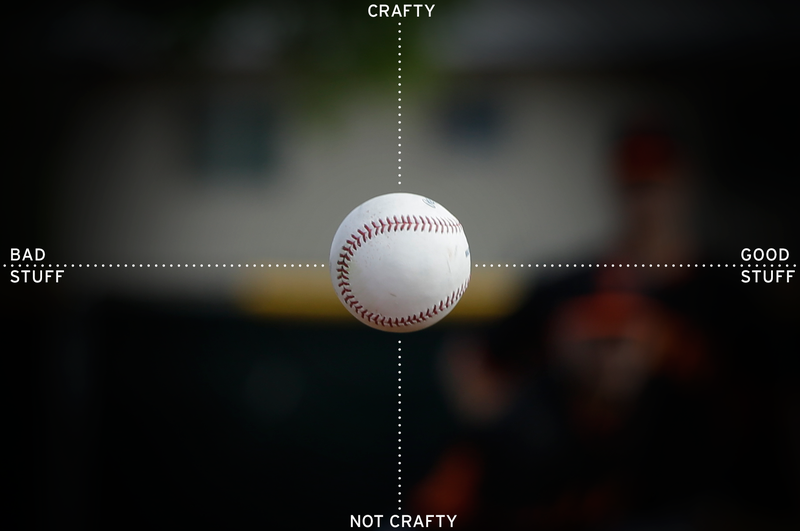 After some discussion, the Deadspin staff concluded that Jeff Suppan fits that quadrant. The Times wandered down a rabbithole about the question of whether stuff refers to the speed of the ball or its spin, and how those references might have changed over time, which misses the point. Stuff refers to how good a pitch is at being the pitch it’s supposed to be. A curveball is good stuff it if curves hard; a fastball is good stuff if it’s fast. A fastball is great stuff if it’s fast and it moves. Or—this is the only really conceptually tricky part—that fastball is part of someone’s great stuff. “Stuff” is a mass noun, like “groceries.” It names the whole thing as a collective. There was some debate among the Deadspin staff as to whether a single great pitch, say Mariano Rivera’s cutter, should be counted as stuff. The question is moot. In practical use, a one-pitch pitcher’s pitch travels under its own name. There’s no point in talking about Rivera’s stuff, because you’re just going to talk about the cutter. So a guy with a 99 mph fastball has a great fastball. A guy with a 95 mph fastball and a hard-biting slider has great stuff. The hitter isn’t thinking about how it’s easier to hit the fastball at 95 than 99, because the hitter has to be preoccupied with what happens if it’s the goddamn slider. When people talk about stuff, that’s what they’re talking about, the pitches and how they fit together. The specifics of the collection can vary: Randy Johnson had great stuff because he had two pants-shittingly unhittable pitches; Mike Mussina had great stuff because he had an assortment of four or five pitches that were all reasonably difficult to hit. Either way, the idea is that a pitcher who can throw those pitches has a physical advantage over the hitter. Whether the pitcher builds on that advantage or undermines it is a matter of craft. Is hitting the strike zone part of stuff? Or is it craft? The answer is another question: If you can’t hit the strike zone with a pitch, do you really have that pitch? Thus an individual pitcher’s stuff is described as varying from game to game. What about a knuckleball? The fact that a knuckleball doesn’t fit very well into this schema is good evidence that it is a valid one. Knuckleballs don’t fit into baseball schemas, which is why they are the best thing in baseball. How about a really frustratingly slow changeup? Or a slider that only breaks a little, but moves just late enough to miss the sweet spot of the bat? Pitches like those are to “stuff” as hand-eye coordination and endurance are to “athleticism”—they should count, but they don’t. “Arrieta doesn’t look like answer,” the Chicago Sun-Times wrote a few months later, after he’d had a string of terrible outings with the Cubs. Tonight Jake Arrieta takes the mound, with 22 wins and a second-half ERA of 0.75, as the only pitcher the Cubs would choose to pitch their single-elimination wild-card game. He’ll bring with him the stuff he’s always had.